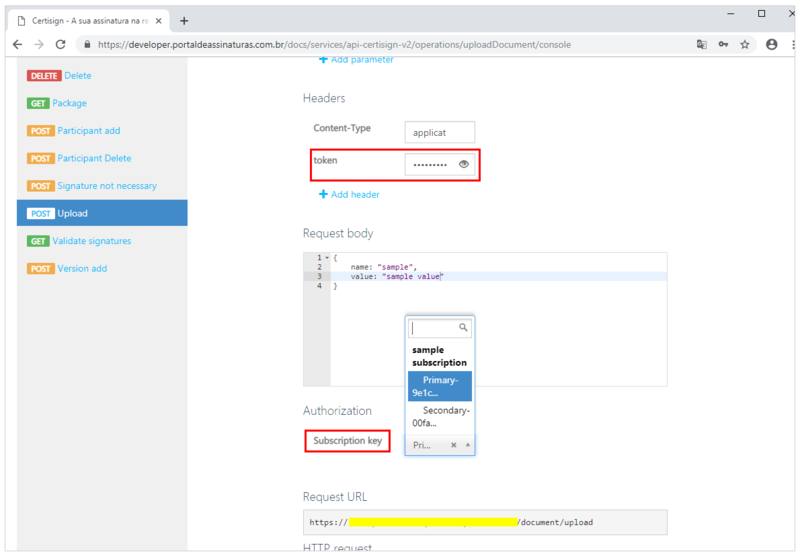 In order to access the API features of the Certisigner, it is necessary to have a developer account in the Developer Portal. Click on SIGN IN and enter your credentials to start using the tools available to assist in the development of integration. If you don't have a developer account, you can create a developer account at this time. When publishing APIs through APIM, the easiest and most common way to secure access to those APIs is by using Subscription Keys. In other words, developers who need to consume the published APIs must include a valid Subscription Key in HTTP requests when making calls to those APIs. Otherwise, the calls are rejected immediately by the APIM gateway and are not forwarded to the backend services. To obtain a Subscription Key for accessing APIs, a Subscription is required. Subscription is essentially a named container for a pair of Subscription Keys. Subscriptions can be obtained by developers who need to consume the published APIs, with or without approval by API publishers. API publishers can also create Subscriptions directly, on behalf of API consumers. Browse the PRODUCTS menu to access the product list. Then select the Sandbox product to subscribe to. After selecting the product you want to subscribe to, click the subscribe button. Then you will be redirected to the subscription screen, where you must enter the name of the new subscription and if you want to receive the callback confirmations, you must inform the data in the callback tab. Visit the callback documentation for more information about setting up and using this tool. The access key must be present in the "token" request header, you can use the primary or secondary key to populate this header field. API calls through the Developer Portal, by default the "token" will already be populated with the primary key, you can choose to continue using the primary key or switch to the secondary key. This option is available in the API authorization session. We provide a tool for you generate tests certificate in order to use it for sign your test documents as well access your account in the Sandbox Signature Portal to set it up. Access Certificates to generate your test certificate. 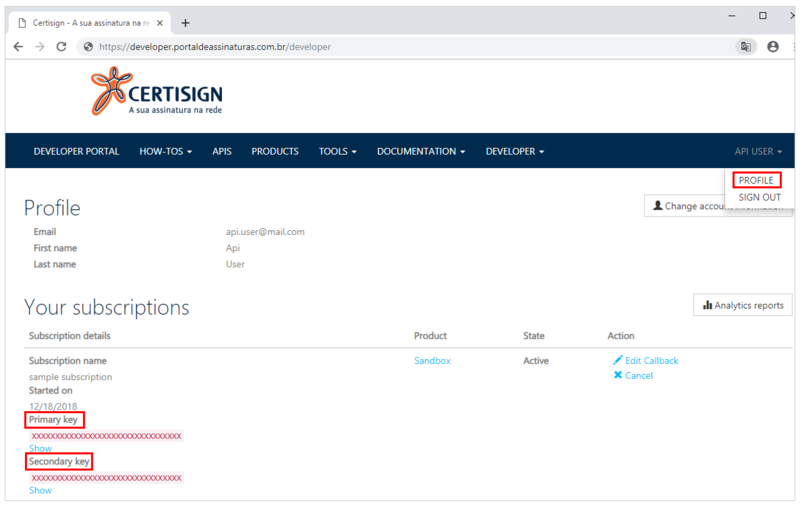 After completing the steps above, you can start integrating with the Certisign Portal API. To facilitate your testing, we provide a Sandbox environment, with the same operations available in the production environment. If you have created your test certificate with the same email from your account here in the Developer Portal, you can access the site https://sandbox.portaldeassinaturas.com.br directly with this certificate. You will see that you have a company with the name of your Subscription already associated with your user. See My Companies item in the Configuration menu. This access is interesting to consult the documents that you submitted by the API, they should appear in Documents of your company. In this way you can validate if your submission was done as you would like, for whom the document was submitted for signature, etc. If you have submitted document(s) for your own signature, it (s) should appear in My Documents. In addition, there are many settings you can create or change to provide the best experience for your integration.